As the demolition of the Calais migrant camp enters its third day, migrants, forced from their “homes” face great uncertainty about where to go next. RT’s correspondent Polly Boiko has talked to some of them about their “plans”. Smoldering logs, debris, burned down or set-ablaze shelters are all part of the scenery at the Calais “Jungle” camp. Realizing that its demolition is inevitable, migrants are still refusing to move away from the camp. Many refugees remain desperate to get to Britain, which is why they are refusing accommodation in official asylum centers, where they fear they will be forced to claim asylum in France. Although the southern part of the camp is on the verge of complete disappearance, many migrants are hoping to “buy time” and move to the northern part, which has not yet fallen under the demolition plans, Polly Boiko reports. “They are evacuating this part going to the north end…but there’s no actual eviction deadline. So there’s always this dream that’s buying time, so they can try to get to the UK,” volunteer John Campbell told RT. According to Boiko, migrants are taking their possessions and simply resettling to another part of the Calais “Jungle.” Those who happen to own a caravan donated by volunteers are simply bringing it with them. “Other side, but I don’t know where,” one refugee said when Boiko asked him about where he was going. “South of the lake they want to destroy, we think here we will be safe,” said another referring to the north part of the camp. Another volunteer at the camp, Liz, said that the current issue of relocating refugees is not going to resolve itself. “These people exist, they are not going to just disappear if you remove the shelters,” she said. 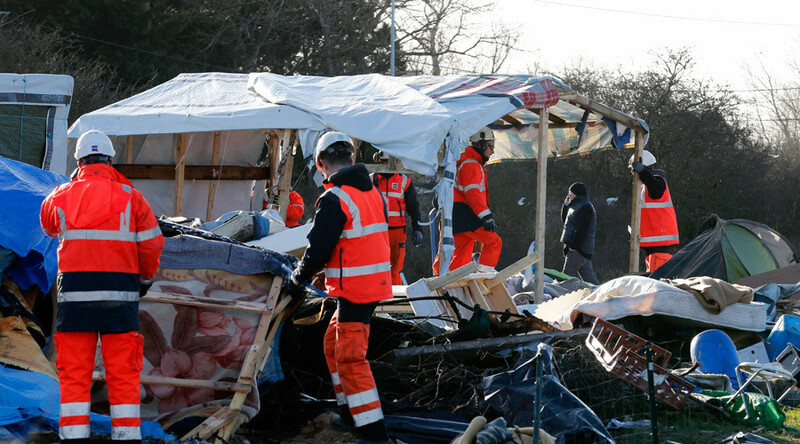 The demolition process began on Monday and resulted in numerous clashes between riot police and asylum seekers. Monday and Tuesday were reportedly rather “chaotic” as some migrants threw stones and others set shacks on fire in defiance of the authority’s decision to get rid of the camp. A number of asylum seekers climbed the roofs of their shelters hoping to slow down the demolition process. Tear gas, and water cannon were deployed by the police to keep the migrants out of the camp area. The third day of the demolition process was reported to be calmer, compared to the previous two days. On Wednesday, some migrants have sewed their mouths in protest against the current situation. Authorities say the demolition will affect between 800 and 1,000 people. Charities working at the camp, however, argue that more than 3,450 people have been living in the southern half of the camp, including 300 unaccompanied children, AFP news agency reported. "Who knows where they are going. It's impossible to know the level of fear and uncertainty they are experiencing at this point," said Tom Radcliffe of Help Refugees as cited by AFP news agency. The “Jungle” serves as a temporary home for over 5,000 asylum seekers, the Help Refugees website reports. It is the largest makeshift camp in Europe and has gradually turned into a small town with its own social life.